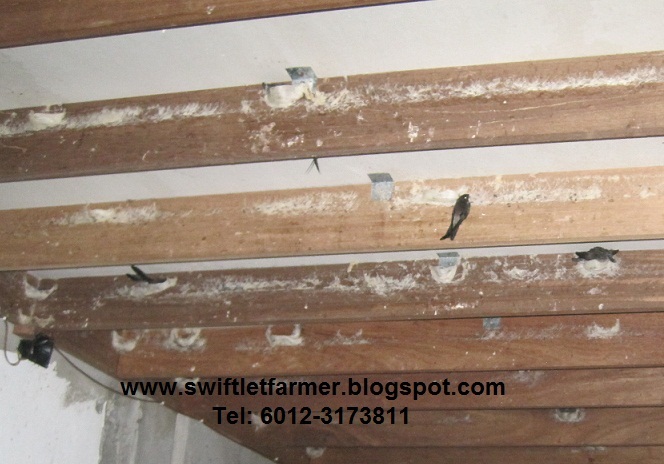 I have been traveling extensively lately, visiting many Swiftlet farms and doing research and development of new technologies in Swiftlet farming. 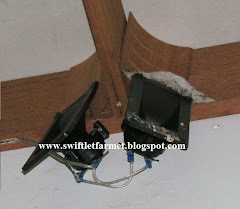 I believe everything evolves and Swiftlet farming is not excluded. 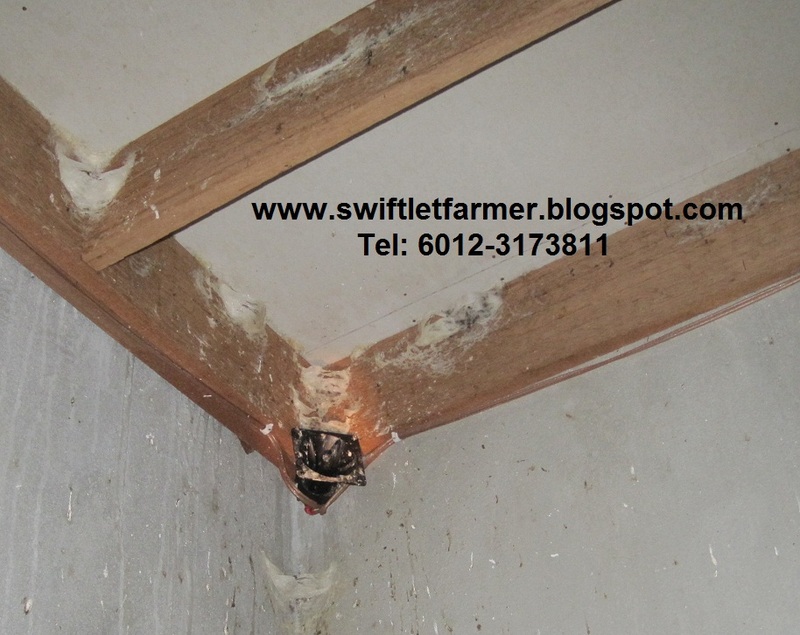 To be successful in Swiftlet farming we need to observe changes and understand why it changes. With such understanding, as a result, we could build good Swiftlet farm that could attract a large number of Swiftlets to build nests in a short period of time. Sincerely, I have no time to write about all my farm visits. I guess my blog readers must be annoyed with me. I would try my best to write and keep you all updated. I had visited this Swiftlet farm quite a while ago. 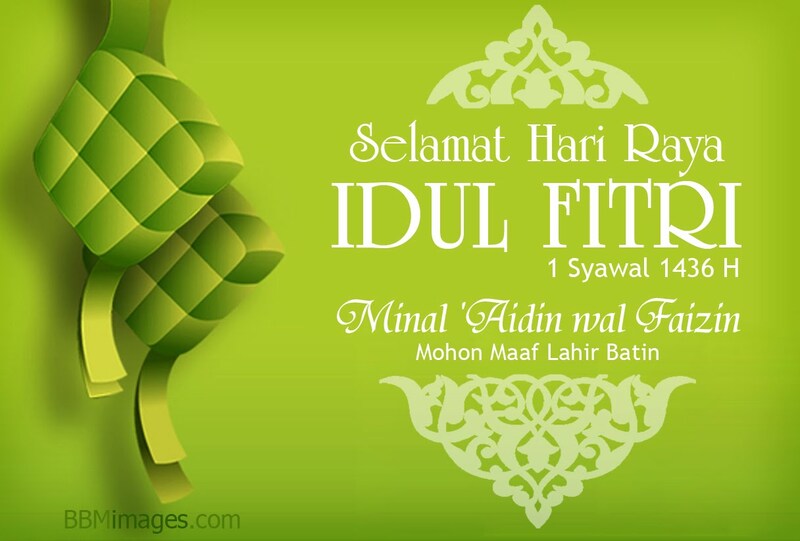 It is located in Kudat, Sabah. (They called it the tip of Borneo). 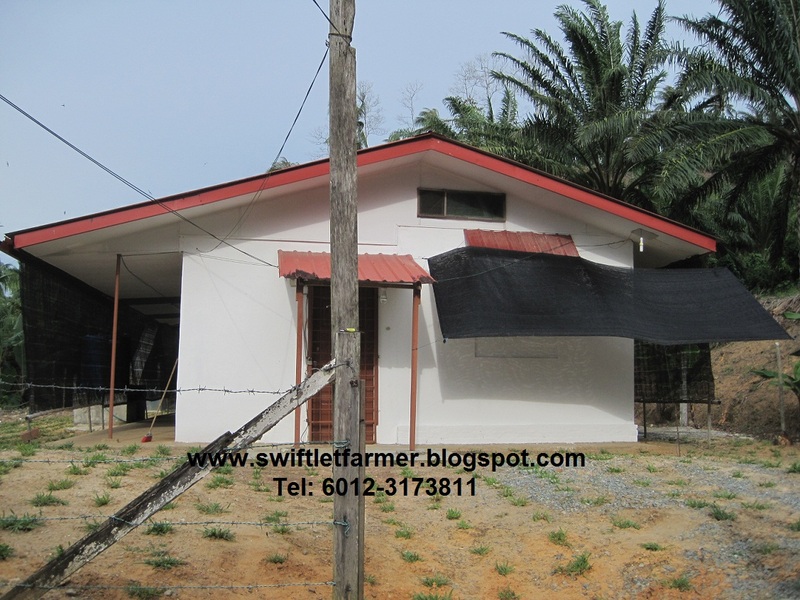 A simple single storey Swiftlet farm. 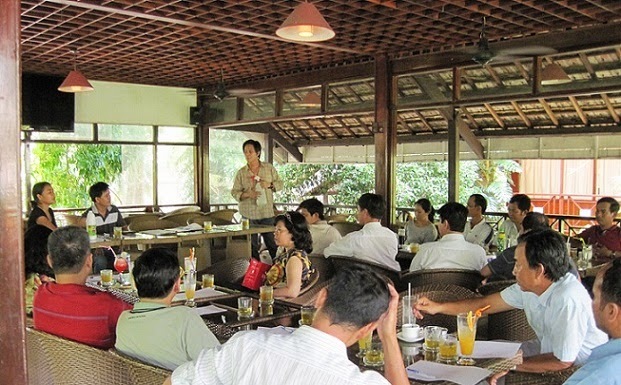 Formerly, it was a hostel for the plantation workers. The owner converted it into a Swiftlet farm not long ago. A beautiful location for Swiftlet farming with plenty of green surrounded by Palm trees. 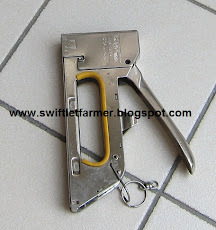 I understand there is no Swiftlet farm around here, the nearest one is about 20 km away. That is the real advantage. 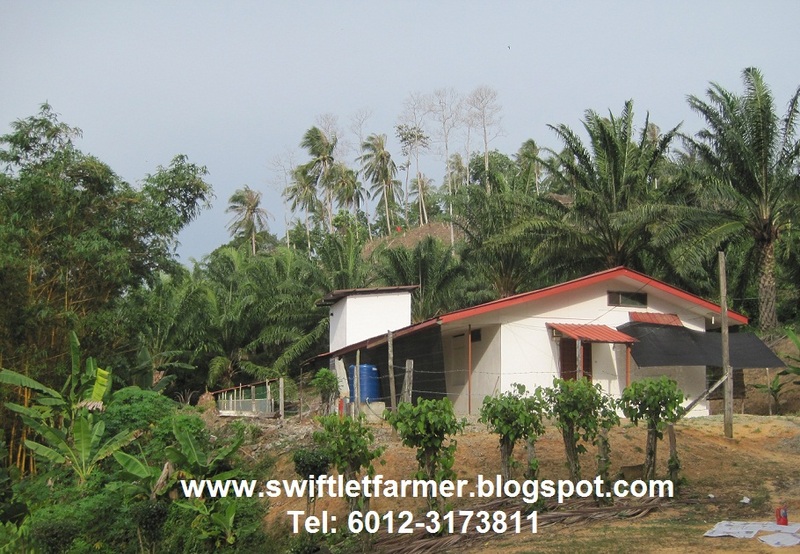 With such perfect environment, one only needs to build a good Swiftlet farm with a good internal environment and internal design. Swiftlets will stay and build nests and the cycle continues. Isn't that simple? 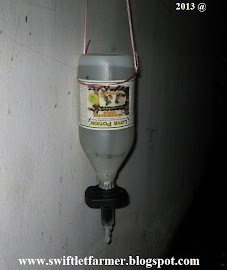 The owner Mr. Y started converting the hostel into a farm after reading my blog. 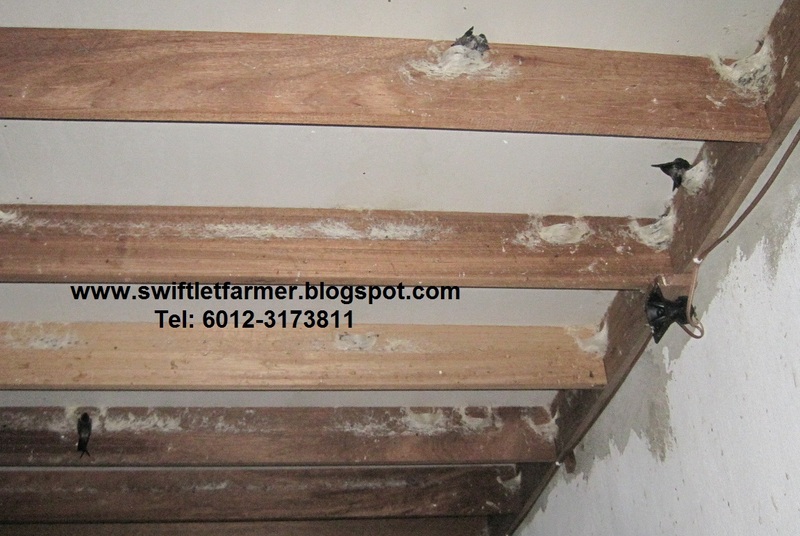 There are about 500 nests in this Swiftlet farms. He had tried numerous ways to increase the number of nest and birds population, yet it remains the same. 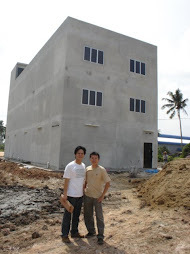 He had contacted me many times wanting to invite me to visit his Swiftlet farm to help him to solve the stagnation problem. To be honest, I had postponed the visit many times. I had pushed it to a further date...which sometimes I have forgotten. His persistency ... finally got me agreed to visit his Swiftlet farm. My schedule was tight, I could only spend 2 days in Sabah. Mr.Y picked me up at the Kota Kinabalu International Airport, from there we headed straight to Kudat. It is a long journey. 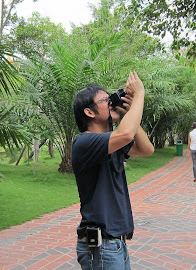 Mr. Y wanted to know why the number of nests remains. He complained every time he harvests them. Most of the nests are either with eggs or chicks. 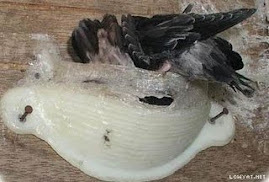 It shows the birds are breeding well but, the number of nest remains the same every month. When I reached there, the first thing I look at was the flying pattern of Swiftlets outside the farm, particularly around the entrance hole. How they fly would tell tales. The way they maneuver, the way the glide and turn before entering the Swiftlet farm all indicate something. If you are knowledgeable and skillful enough you could interpret all these moves. 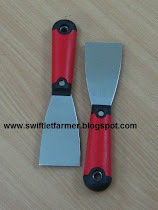 There are many Swiftlets flying outside. 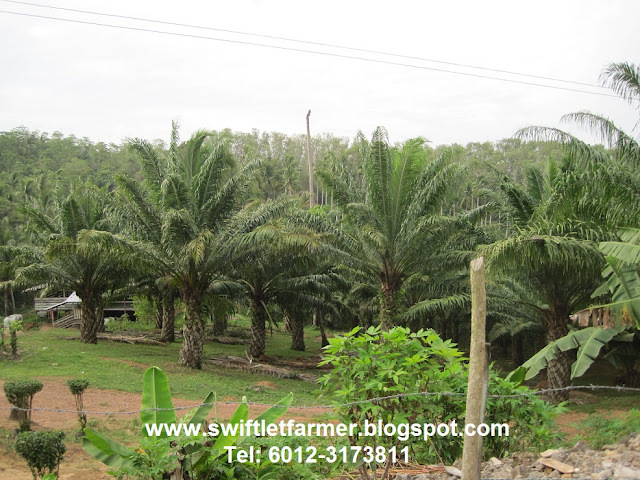 Most are flying higher than the surrounding trees around the Swiftlet farm. I noticed there are Bamboo and Palm trees right in front of the Entrance hole. This obstructed their flying path. 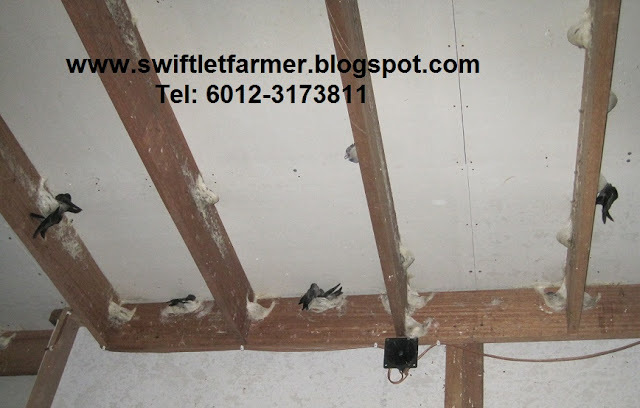 Though most of the Swiftlets could still negotiate the turn, if the trees are cut then it would significantly improve the flying path. I told Mr. Y that the trees needed to be chopped down. Amazing, look at the nests inside, they are everywhere. But, I am not too happy about it. By the looks of the nests, it tells tales. The birds are suffering. they are having a hard time building their nests. 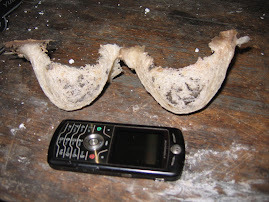 The size and shape of the nests show the humidity is not sufficient. Some nests are half built and left behind. 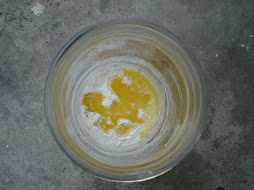 Some are elongated and out of shape. 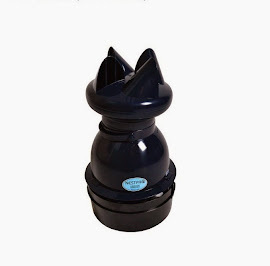 Those nearer to the humidifier have a better shape. No wonder the population stagnated. There are many lines of nests marking on the planks. 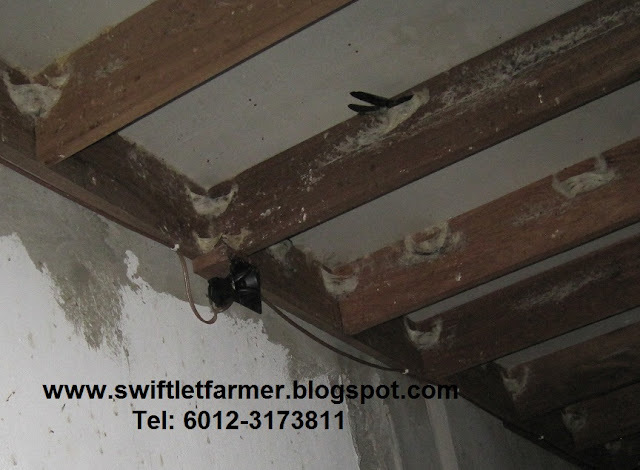 It shows Swiftlets are eager to build nests. 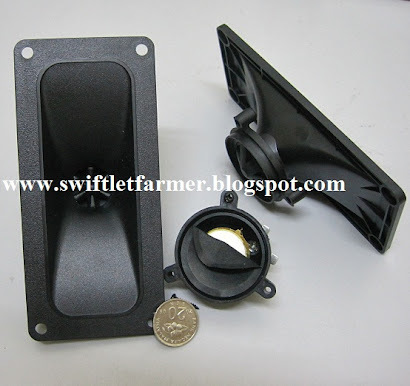 I told Mr.Y that his farm internal environment is poorly managed (micro). 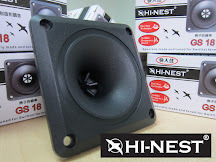 The quality of nests showed. 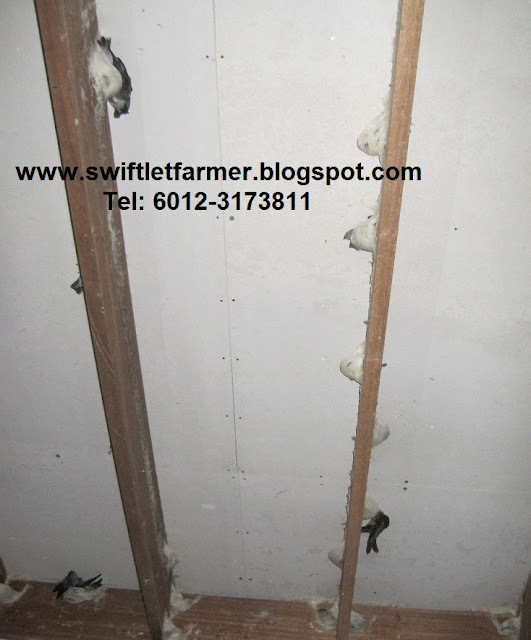 The Swiftlet farm, at times either too wet or too dry. It should have constantly maintained at a level. 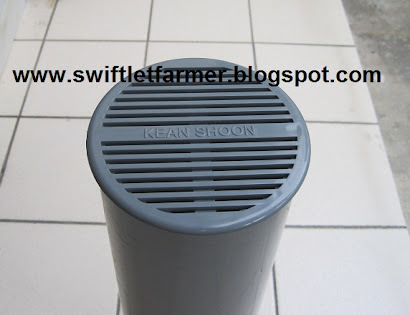 He replied, I have many humidifiers in the farm and I switch them on very often. How come the humidity is still insufficient? 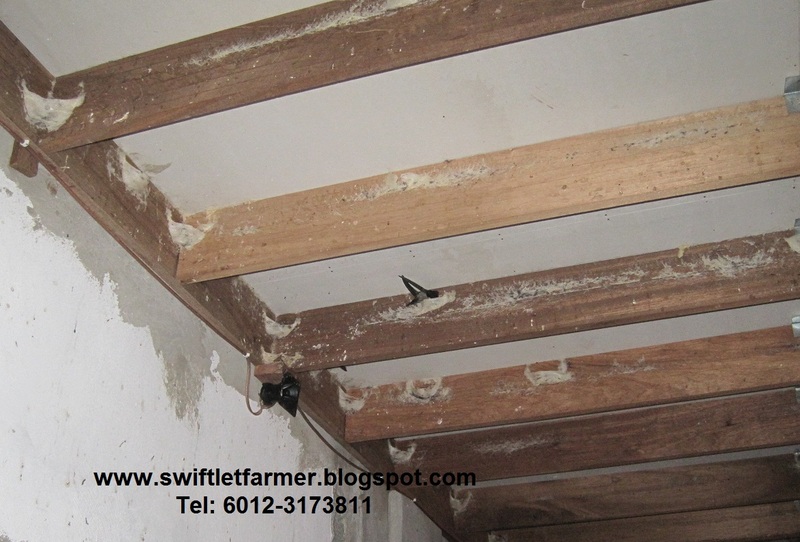 I told him there are many things inside the Swiftlet farm that could affect the humidity. 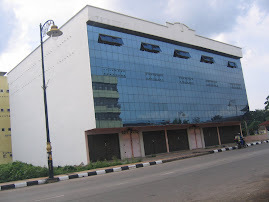 To name few.....ventilation hole, the size of the entrance hole, the size of the 2nd and 3rd entrance hole, gaps between partition, gaps in the ceiling, etc. Rh could escape through one or few of the above. So there are 2 major things we need to pay attention to. 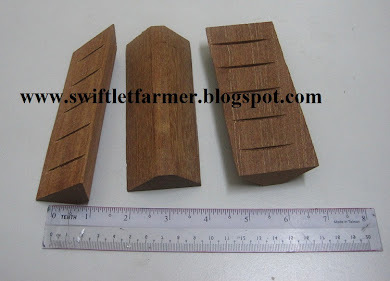 1) Building and designing a good Swiftlet farm that resistant to temperature and the ability to maintaining humidity. 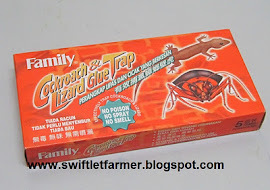 2) Know-how and skill to control and manipulate the changes of the internal environment ( Micro). I taught him how to control the micro and all the things he needs to know about Humidity management. He said he never knew that. It is so complex. All this while what he knew was when the humidity is low just install a Humidifier. The sound system arrangement is disastrous. There are barely 30 internal tweeters. 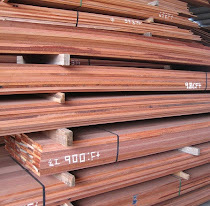 According to Mr.Y, "some Sifus said no need so many tweeters". Obviously, if the sound system arrangement had been done properly. It wouldn't be 500 nests now. If would have been 1000 or more nests. Nests were built on the straight planks This is what we wanted. It is a good sign. To push the numbers of nests to double within a year is not a problem. But, there are so many things need to be rectified. 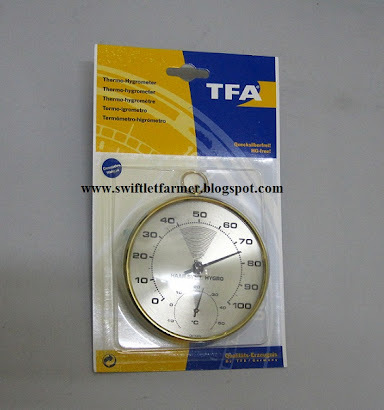 Certain parts of the farm are too hot reaching 32C, those areas that faced the sun. Where you could see the black Orchard nets were used. That is not a long term solution. 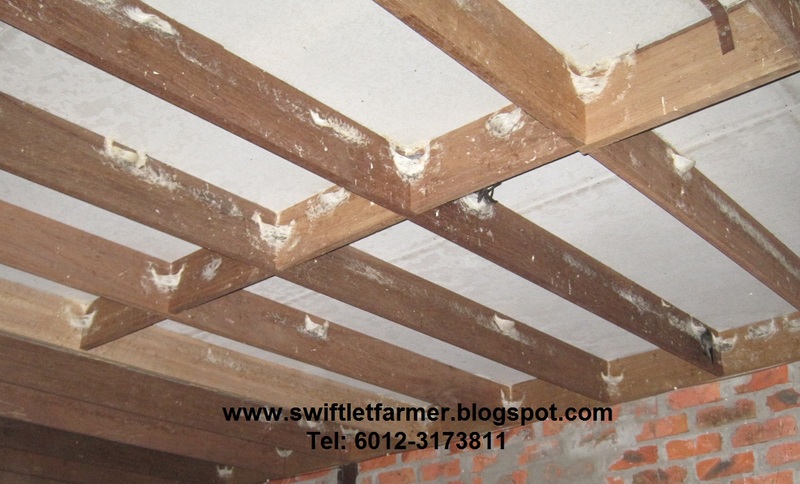 Swiftlet farming is a long term commitment. Do it or done. If you intended to try it out or for short term planning my advice is don't get involved. Better invest your money in other industries. 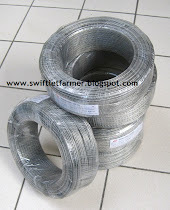 An additional wall is required to be will outside to reduce the temperature. 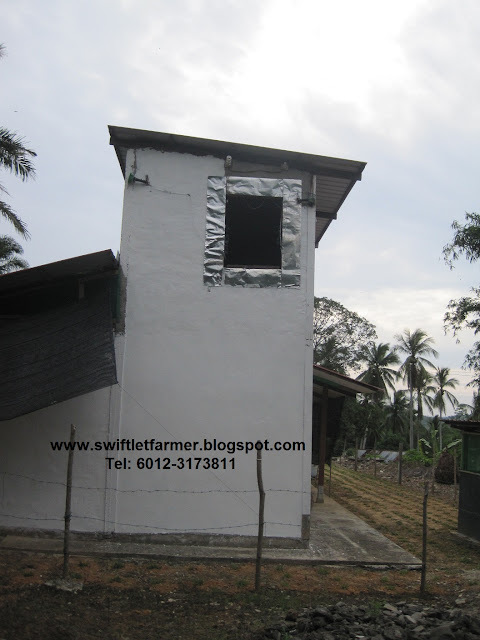 Since this Swiftlet farm already has nests it is worth to spend money to improve the macro thus increasing the nests. 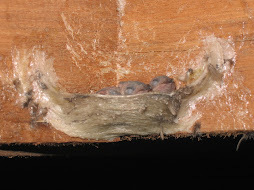 The internal walls need to be plastered smooth to prevent predators from climbing to the plank. This can't be taken likely. 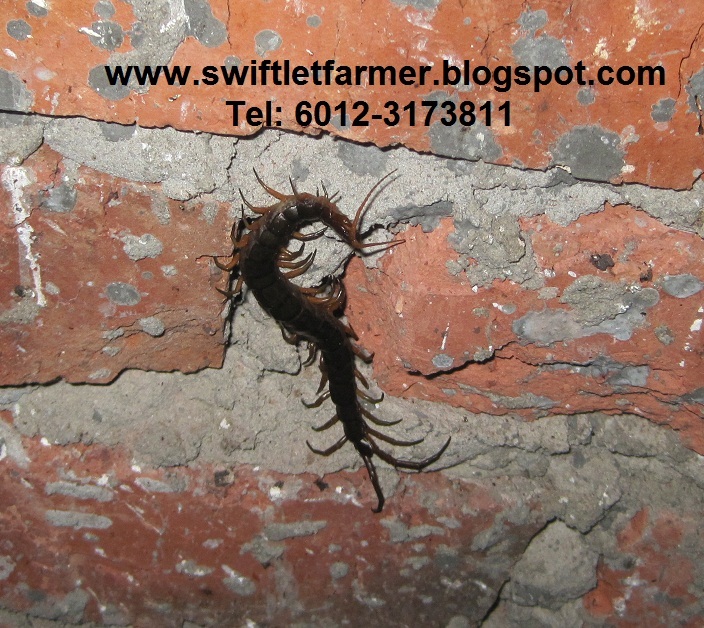 ( Rodents, Snakes, musang, giant centipedes, etc) Seeing is believing, I found a huge giant centipede on the wall below the plank. This centipede must have been surviving on eating the baby birds. 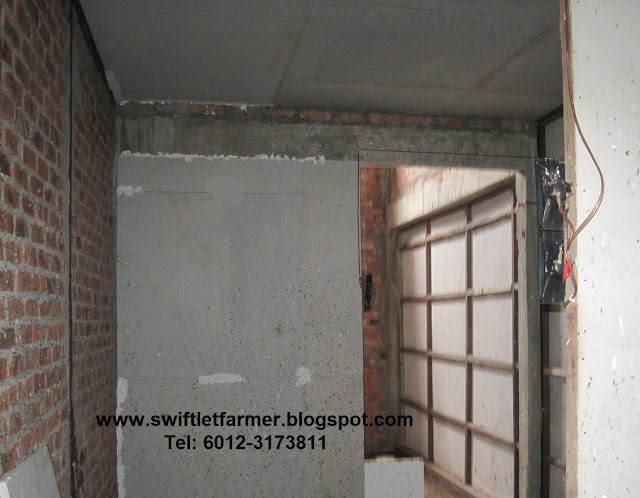 The second entrance hole is too big, allowing draft air to flow into the farm. Therefore reducing the RH% level. In such condition, even with many humidifiers switched on it wouldn't help. So the size 2nd entrance hole has to be reduced. The size of the 2nd entrance hole has to be according to a calculation or should I say a ratio between the main entrance hole and the size of the whole farm. 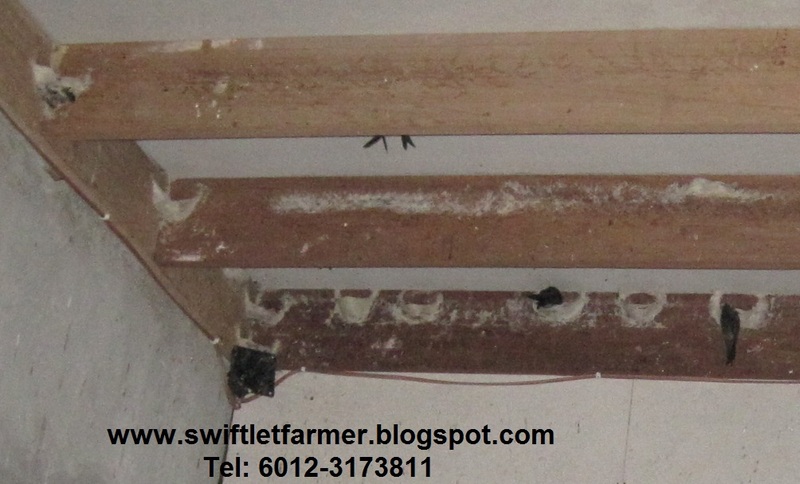 There are no corner boards in this Swiftlet farm. 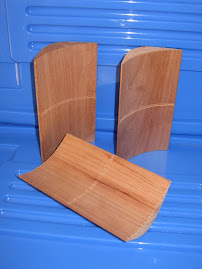 Mr.Y was advised not to install corner boards by a so call"SiFU". It is misleading. 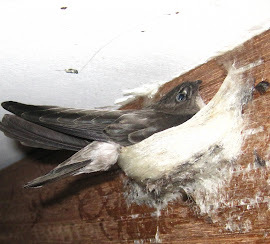 If there are corner boards then it would have eliminated all the corner nests. 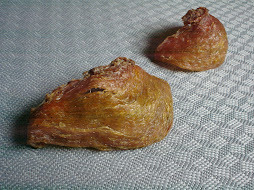 And the harvested nests could fetch a better price. Sound system formation plan was given to Mr.Y.... a plan indicating where and how many units of tweeters to be installed ( the type of tweeters) The strategic position. 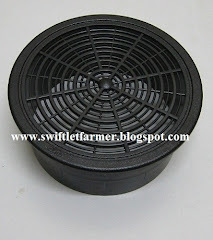 Included Entrance hole, hexagonal tweeters, 2nd and 3rd entrance hole, nesting areas, the farm roof, etc. Also without forgetting to teach him about tweeter wiring connection ( parallel wiring). Never overload the Amplifiers. 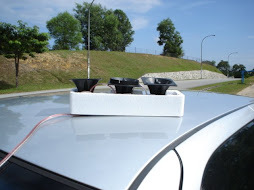 Overloaded Amplifier produces poor quality sounds which you will not be able to differentiate with your ears unless you have a sound detection software to test them. Besides that, the next move is to add planks between the straight planks. To create more planks areas for nesting. That I would teach Mr. Y on my next visit. Above are the pictures of Mr.Y's farm. Imagine if it has been taken care or shall I say know how to take care ( managed well) reaching few thousand nests in few years would be easily achivable. 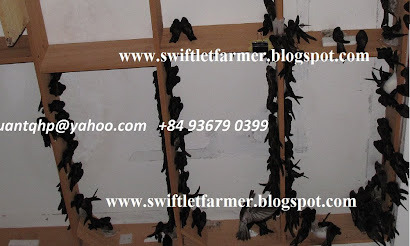 In Swiftlet farming I believe everyone can do it. The most important thing is doing it the right way.